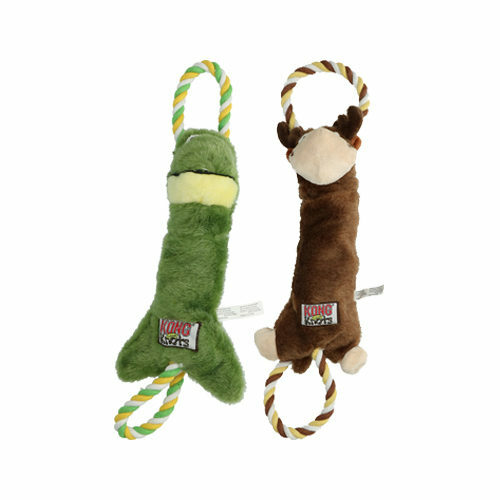 The KONG Knots Tugger has a knotted rope on both ends and is therefore an ideal toy for tugging and fetching games. Because the ropes are knotted from the inside, this toy is extra strong. There is a squeaker in the toy for extra entertainment. The Knots Tugger from KONG is a perfect toy for playing fetching or tugging games with your trusty pet! This cool toy contains a knotted rope on both ends and a squeaker for even more entertainment. Because the ropes are knotted from the inside, this toy is extra strong. Have you used KONG Knots Tugger before? Let us know what you think about this product.